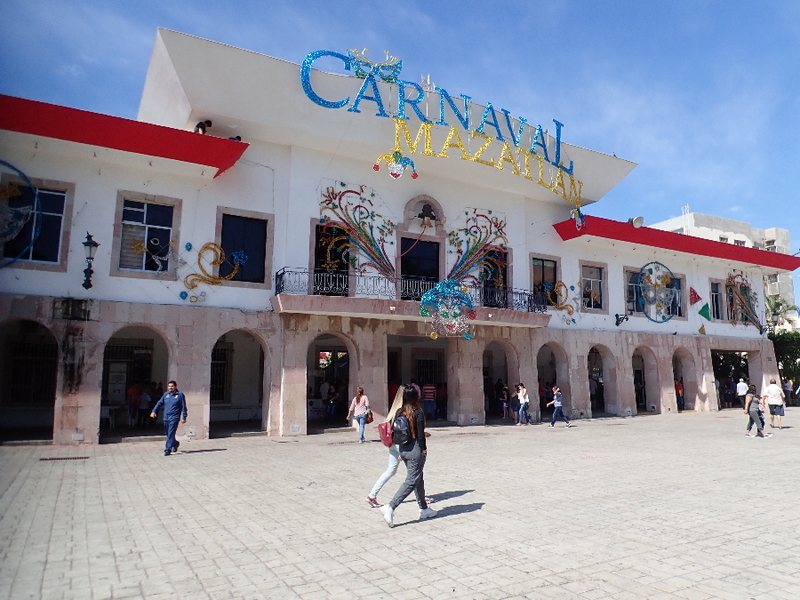 A bit about Mazatlan and it’s immediate surrounding. 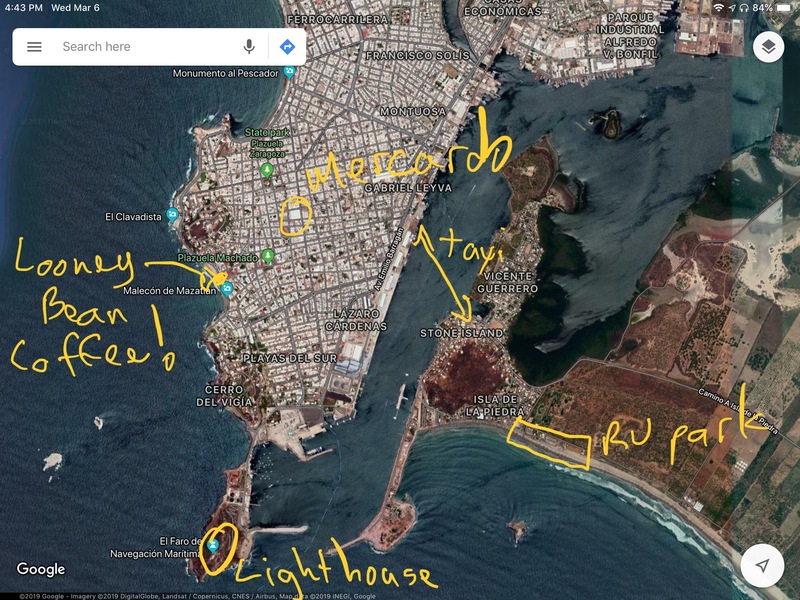 Below is a snapshot from Google Maps and shows old Mazatlan on the left, a sea channel which serves as a harbor and a more rural area on the right known as Stone Island or Isla de las Piedras where the Tres Amigos RV park is located. 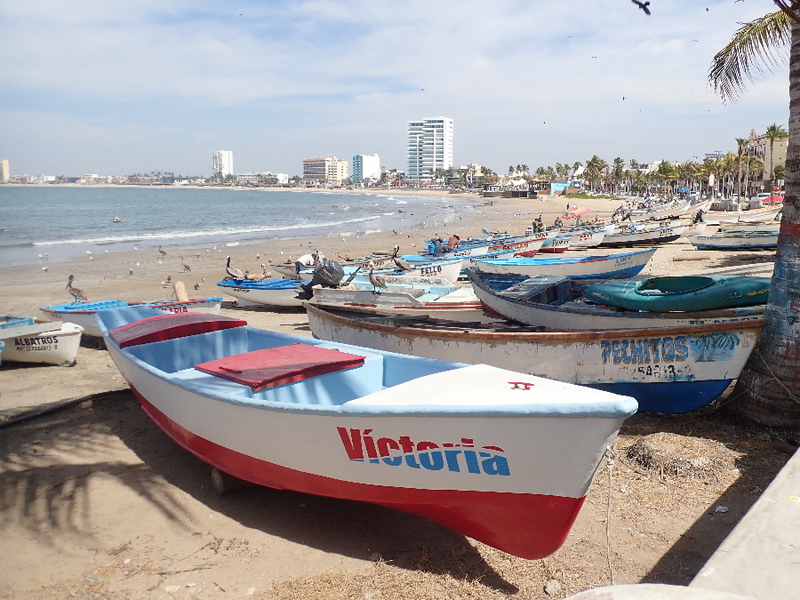 Next day was “this is how you get to Mazatlan” day for us first timers and Mark & Barbara, our wagon masters, showed us the ropes. From above you can see that the RV park is along the beach and we walked NW’ish over to where the water taxi crosses the shipping channel. 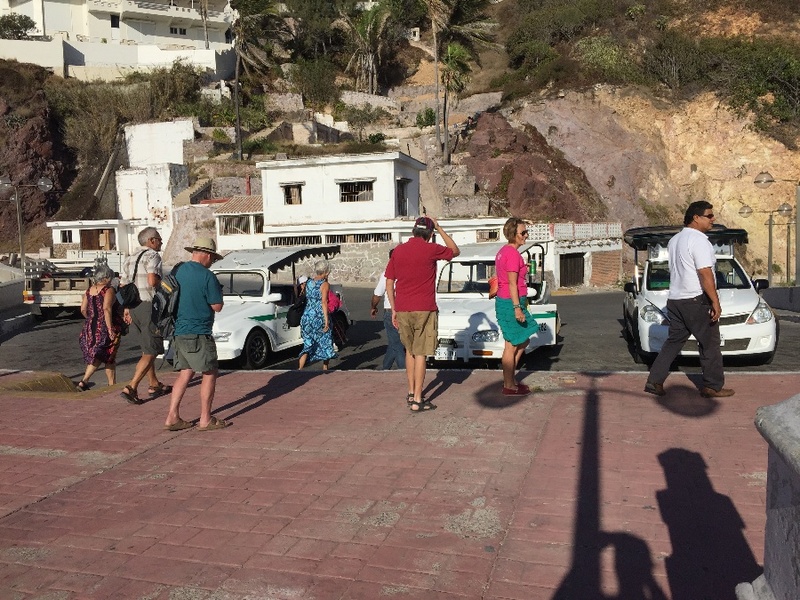 There is a photo of the water taxi a bit further down and on the city side there are a slew of Pulmonias to take you to your destination. 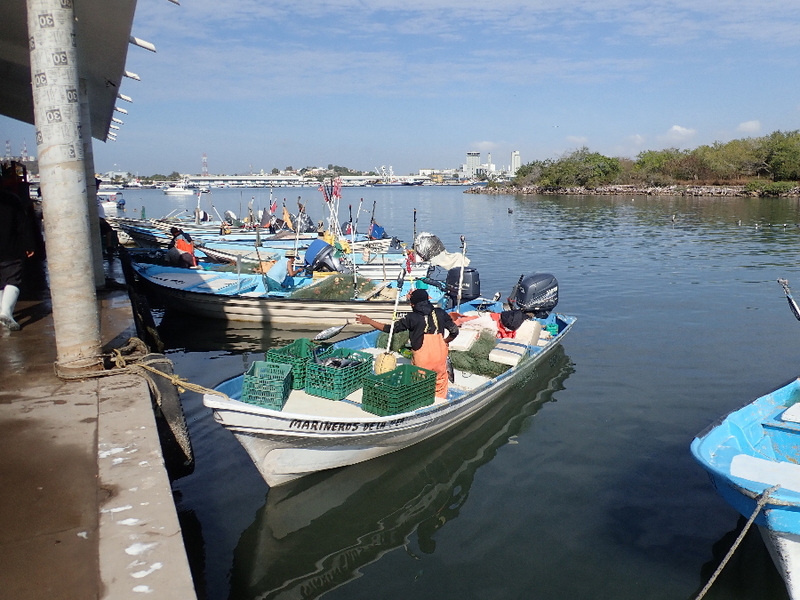 Local fishing boats with Mazatlan in the background. 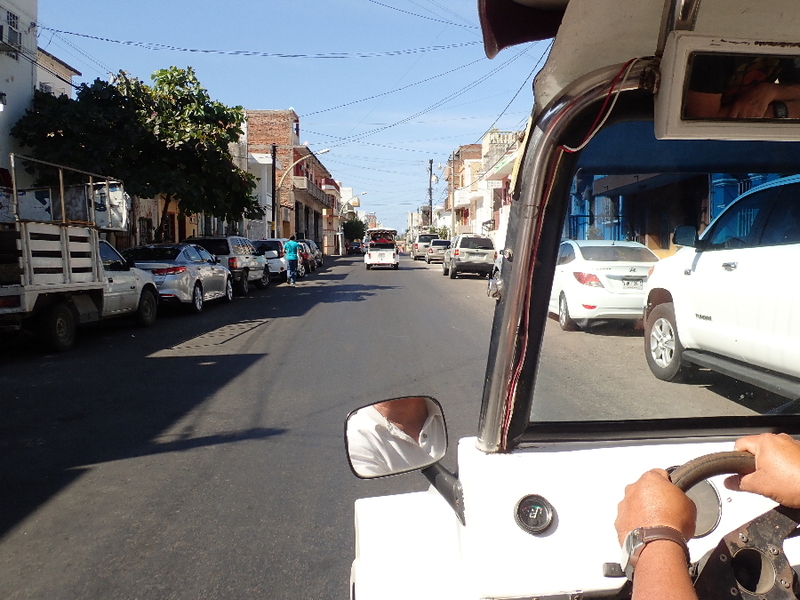 Passenger view out of Pulmonia taxi. 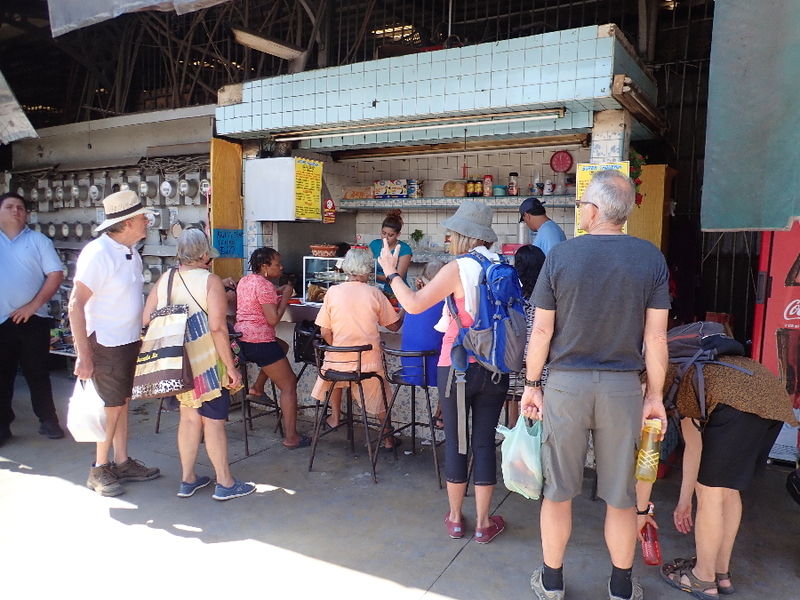 We all went to the main market, Mercado, and walked around it. Not being in the shopping mood for either T-Shirts or chunks of meat Rose & I drifted outside and over to the Cathedral to get a feel of the town. 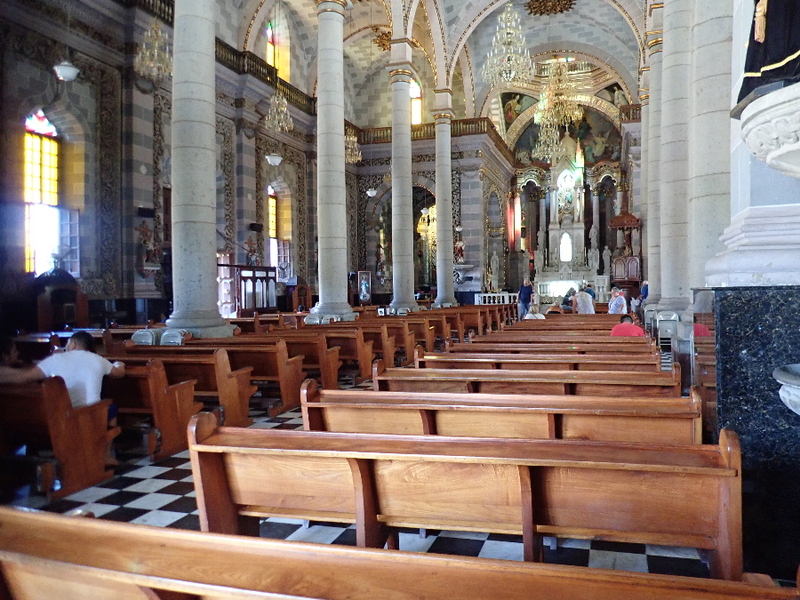 Mazatlan’s Basilica of the Inmaculada Concepción. 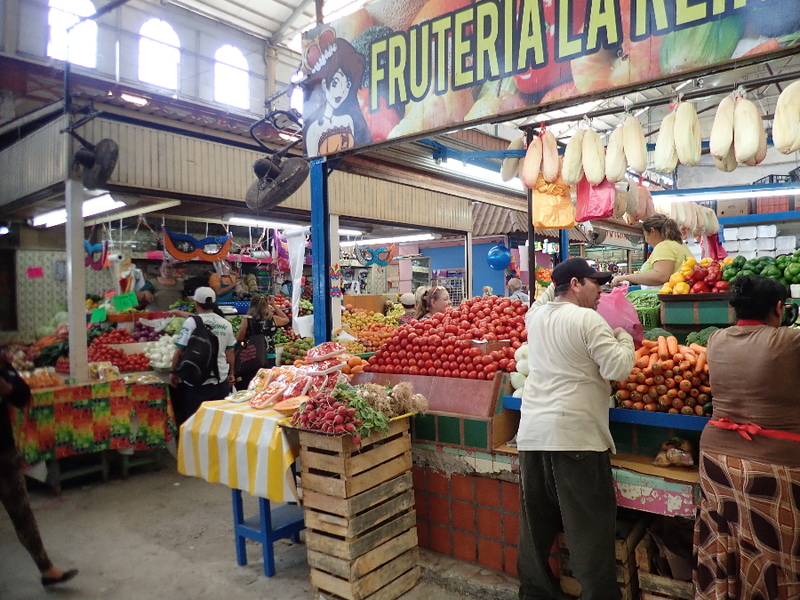 One of the veggie stalls inside the Mercado. All ended up having a snack here. Could be the subject of an oil painting. 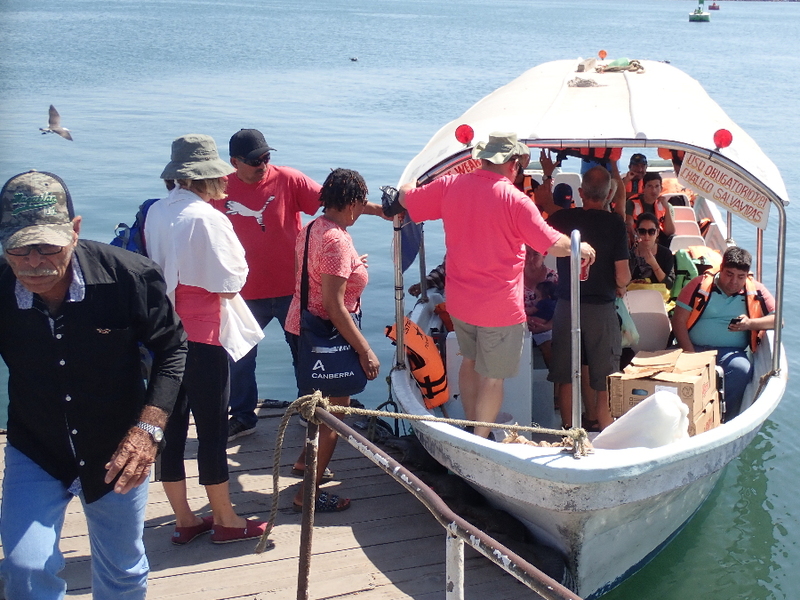 Getting into the water taxi. Walking out of the park and onto the beach the usual two options. 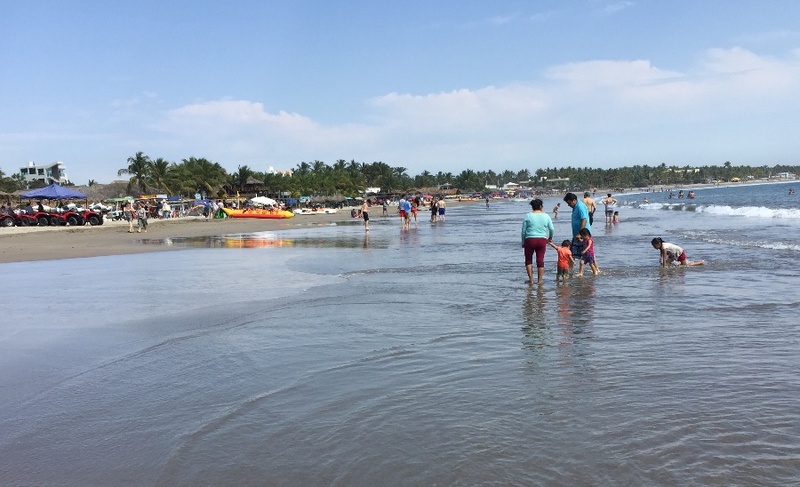 To the right are the restaurants, vendors and water activities. To the left are miles of hard packed sand for walking or jogging on. We went right to where all the activity was. Beauty on the beach. 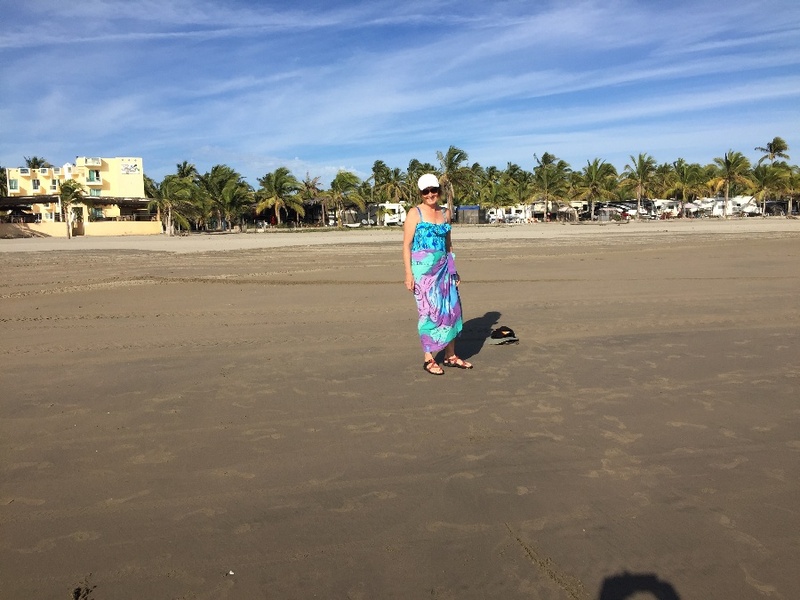 That’s the Tres Amigos RV park behind her. 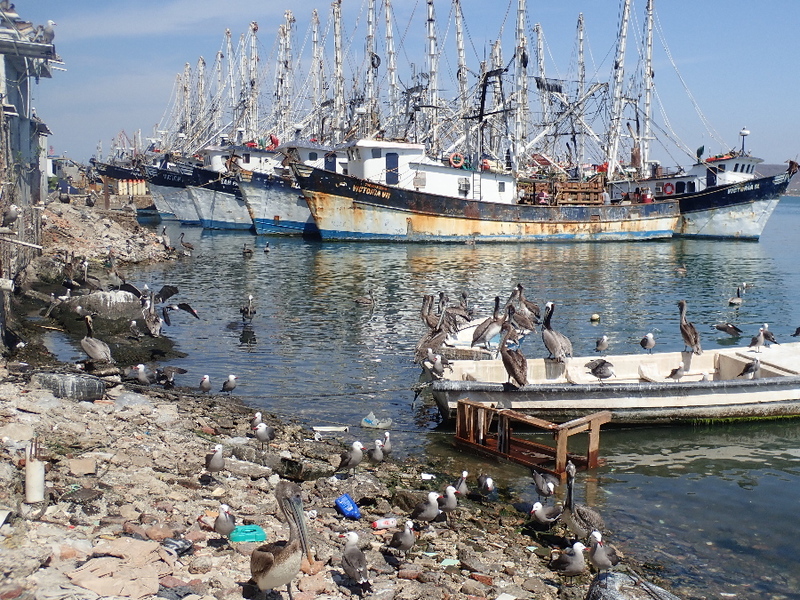 Picked El Velero for a margarita’s & snack while we surveyed the activities. Favorite place for the locals. 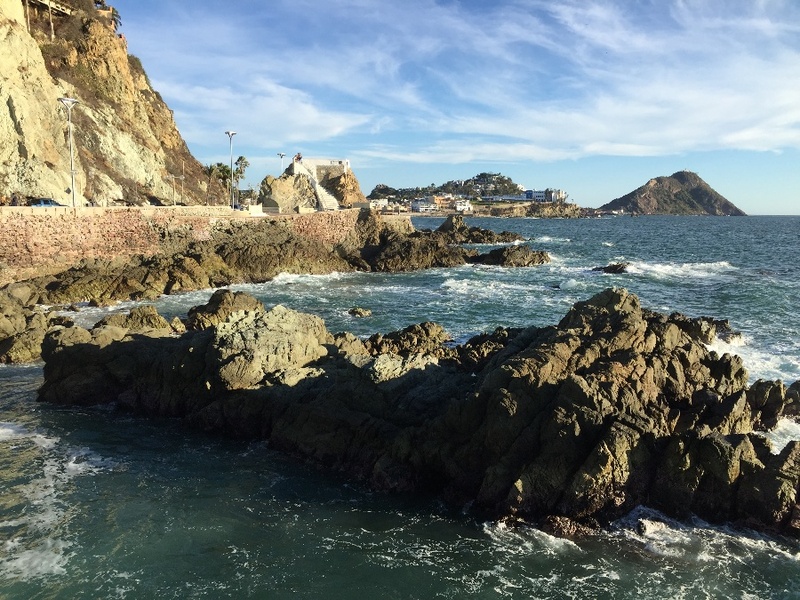 Time to go back to Mazatlan and explore on our own. 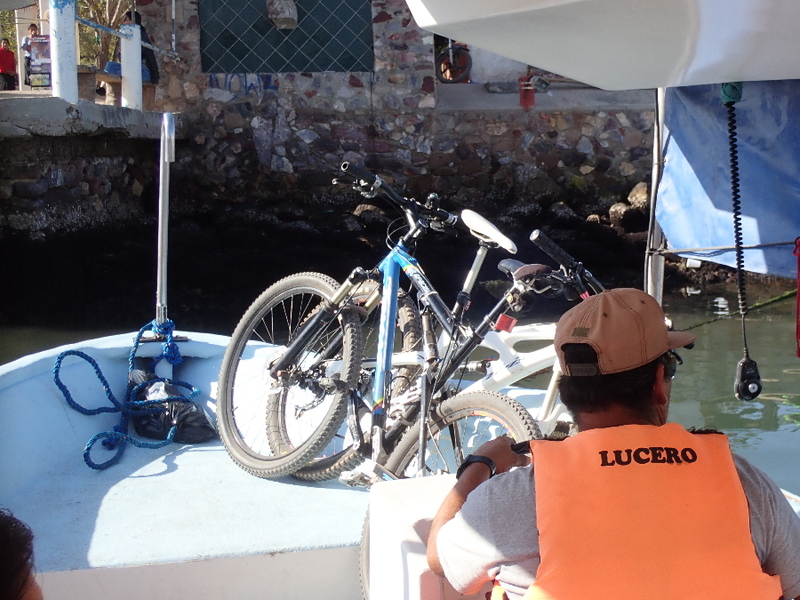 This time we took our bikes with us to be more independently mobile. Took our bikes over to the city. 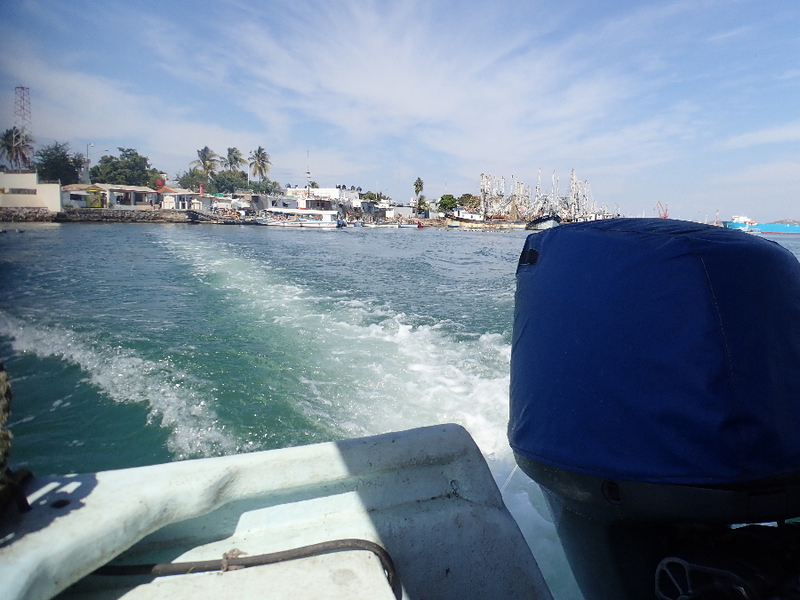 Back to the map above; we rode from where the taxi deposited us down towards where the lighthouse is, busy road to start with but got quieter as we neared the end of town. 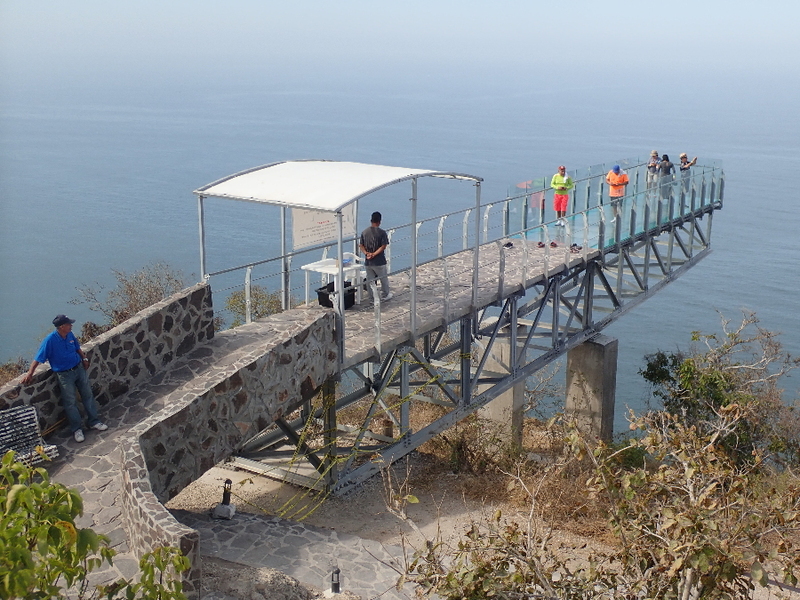 Headed for the lighthouse and found the hiking trail leading upwards. 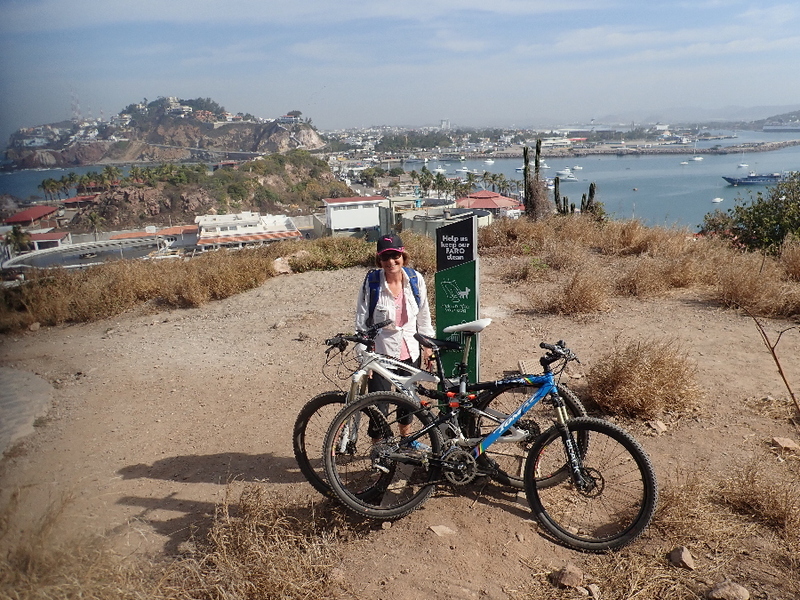 Rode & pushed the bikes to the second switchback and then locked them up to a sturdy post. 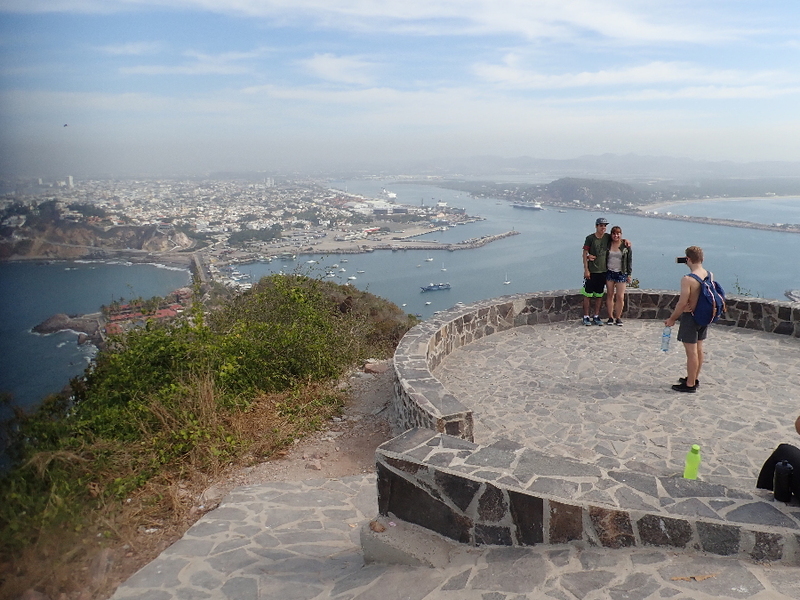 Trail was busy with tourists and locals out for exercise so we deemed it safe to leave them here. Hike up to the lighthouse behind me. 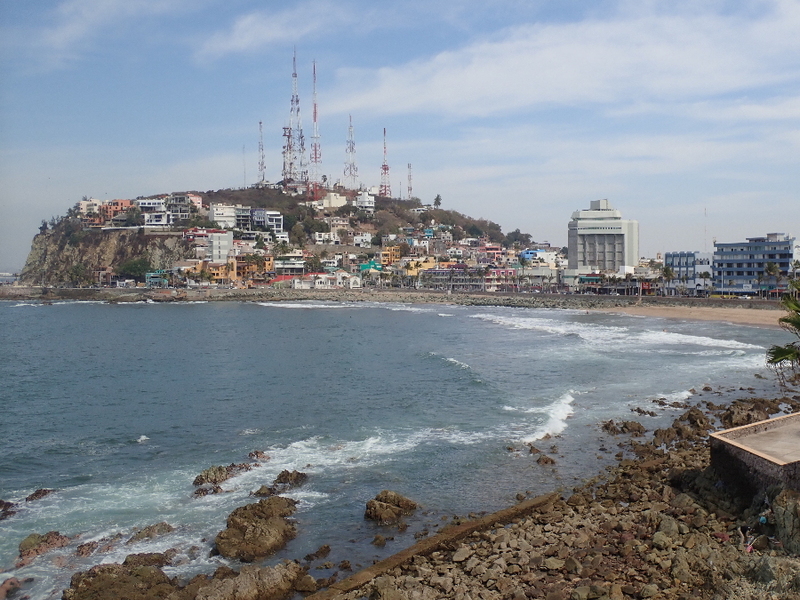 Mazatlan on the left (north), shipping channel and Stone Island on the right (south). 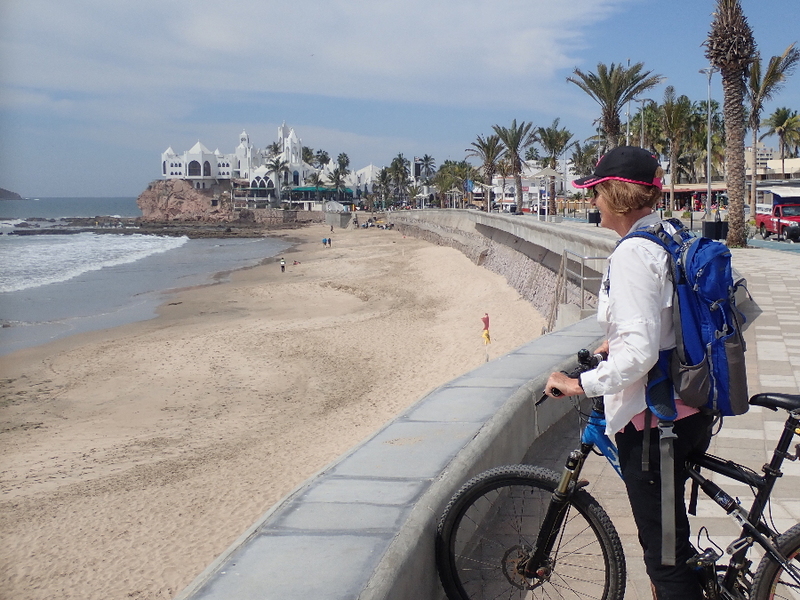 Enjoyed the exercise and we continued our ride around the rocky coastline. 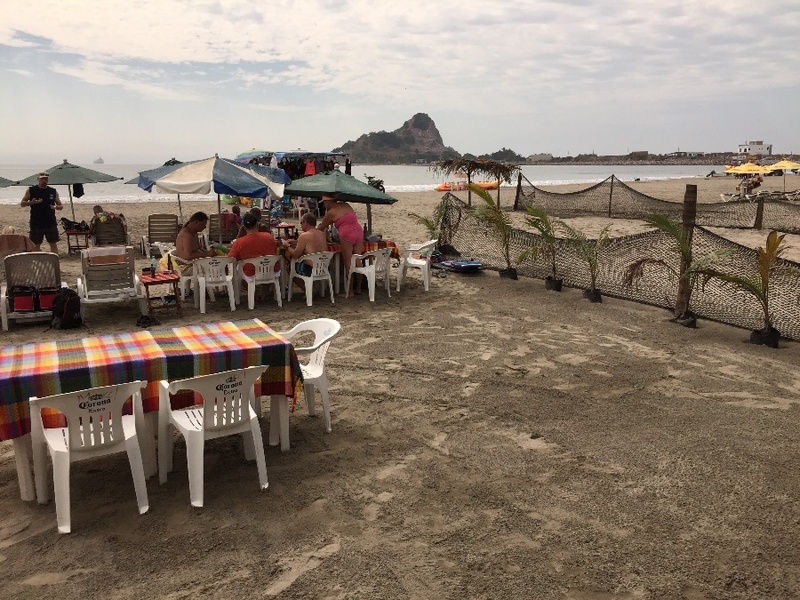 Came upon a small bay that had the ambiance of old Mazatlan with minimal gringo tourists around. 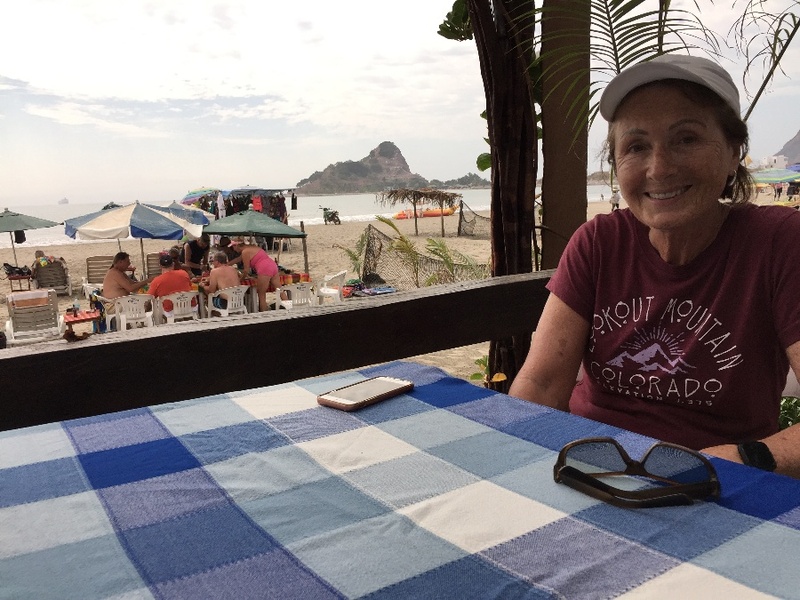 Rose found what would become her favorite coffee shop, Looney Bean, and we paused to enjoy a cappuccino. Antenna’s are an eyesore but we liked this little bay. 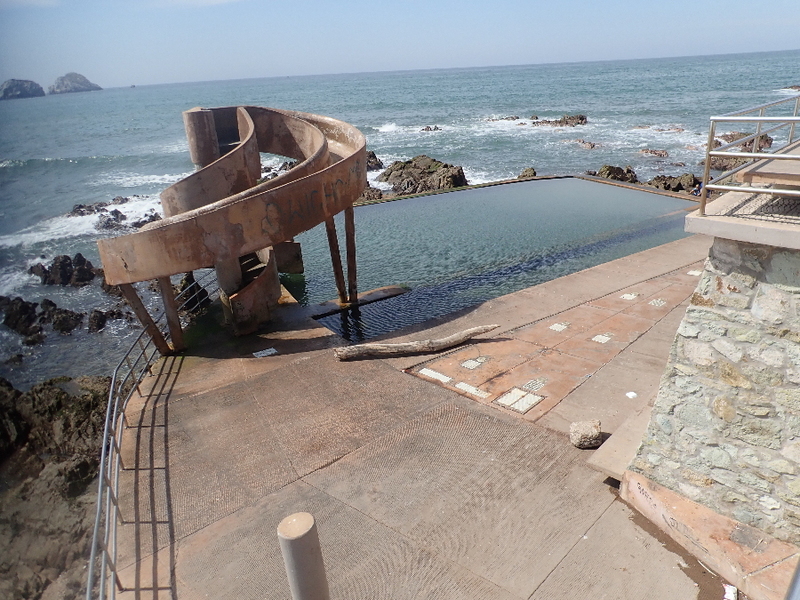 Tidal pool, I grew up learning to swim in one at Kalkbay, Cape Town. 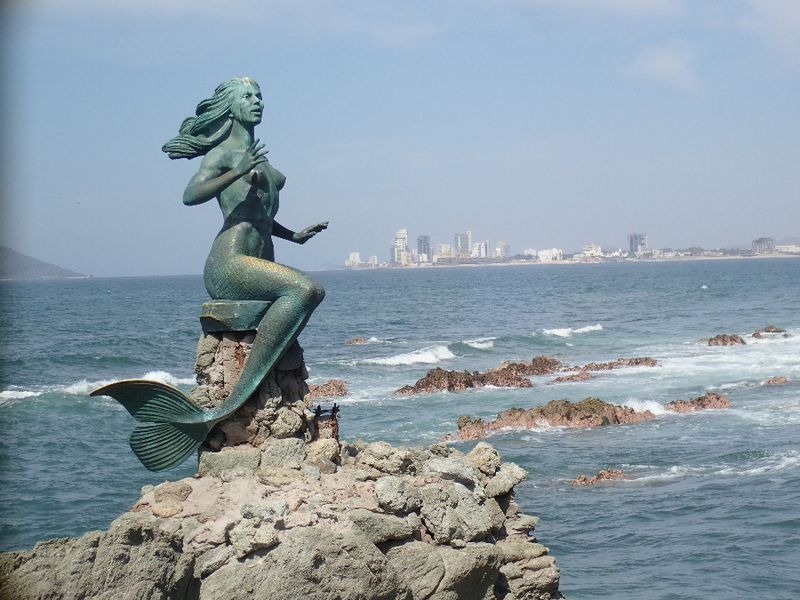 Made me think of the little mermaid in Copenhagen. 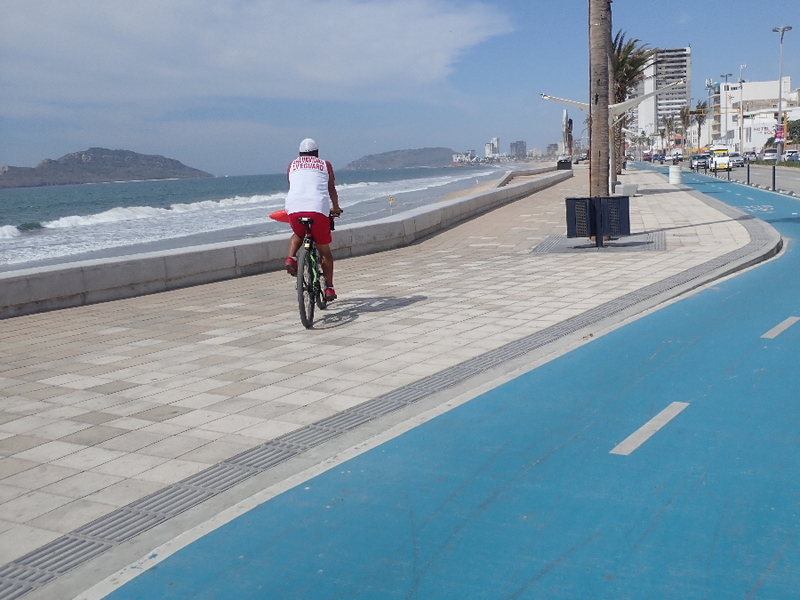 Around the corner from the Looney Bean we reach the mail malecon which makes for good cycling and even has a blue bike path alongside it. Eye catching restaurant that indicates the start of the hotel zone just around the corner. 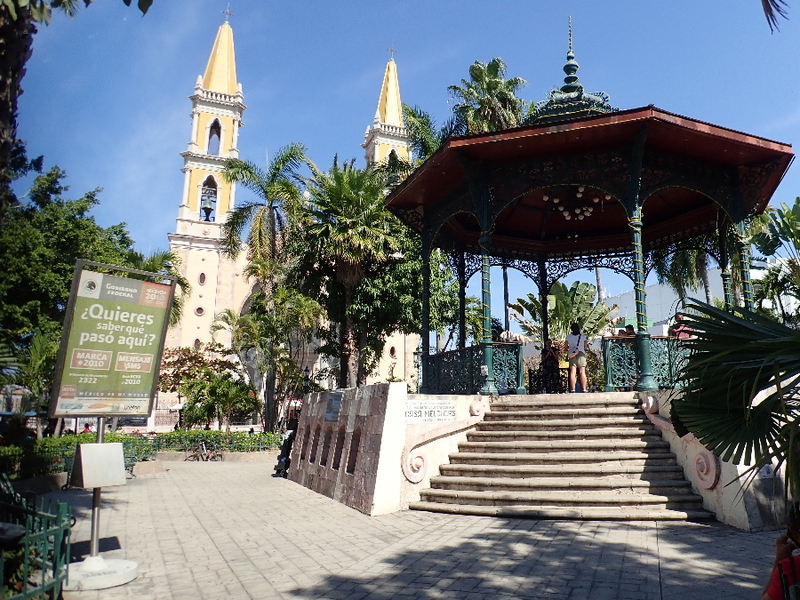 A few days later we were treated to a tour of the city and our group piled into three pulmonias that showed us some new and some old sights. Group city tour by pulmonia. 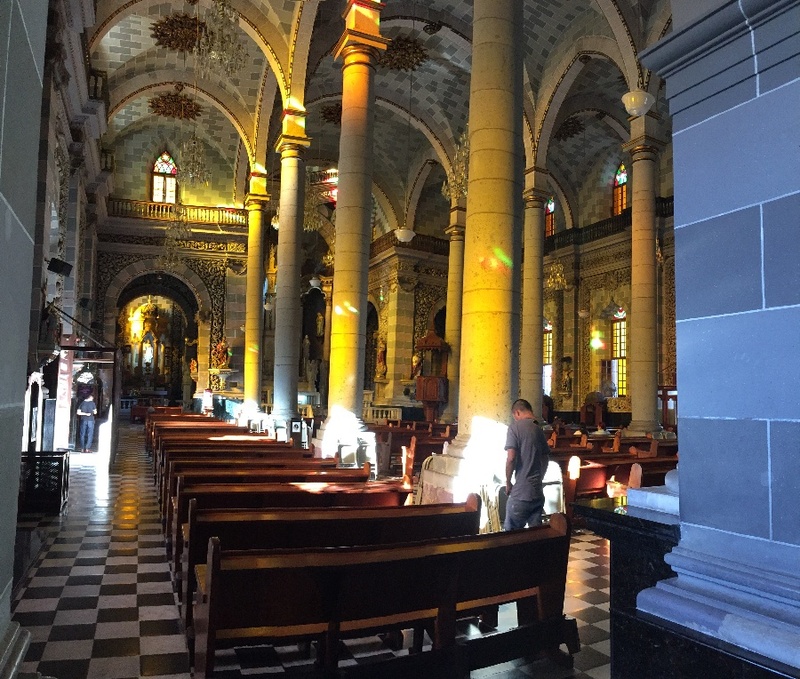 Different lighting in the Basilica. 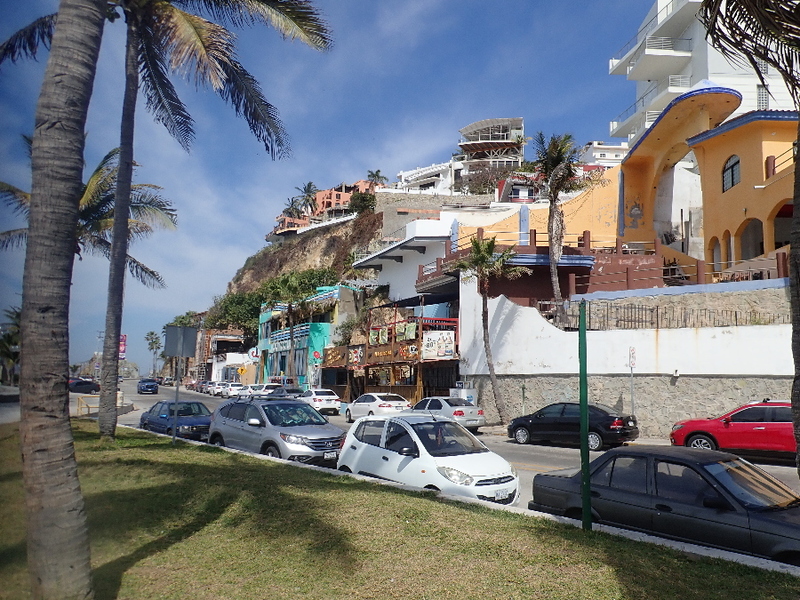 That’s the light house hill on the right and the mail malecon is behind me.